We have a view, myview, that is added to the https://www.adomain.com/some-page/ page. It has an exposed filter, Topic that a person can use to filter the user where Ajax = Enabled so that it loads the results without refreshing the page. The view is added to a landing page (content type = basic) and at the bottom of the page. It is meant to return nodes where topic tag value is equal to what is supplied from the url. Display all items when https://www.adomain.com/some-page/ is loaded. 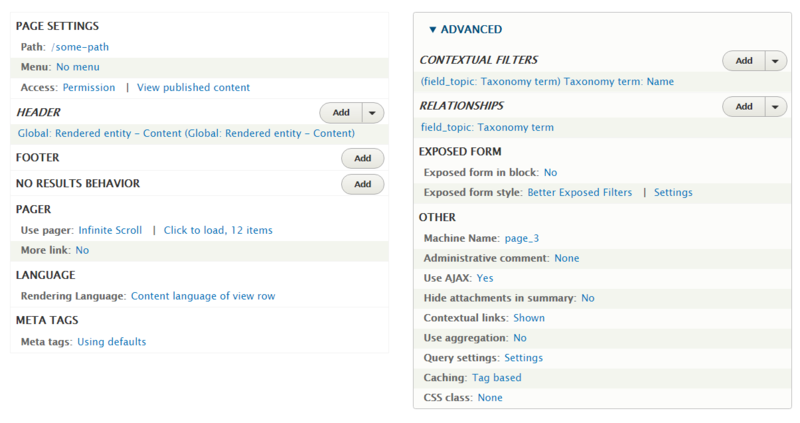 Add contextual filter: Name from Taxonomy term (field_topic) with the following settings below. Content Views don't have access to Taxonomy term name information out of the box, you only have term ID available. So even if you add the Taxonomy term field as the contextual filter and set the Validator = Taxonomy Term Name you're not telling it what to use, you're basically making a mistake trying to use that validator. add a Relationship to the term: Taxonomy term referenced from field_topic. Require it if you only want to list nodes that have a topic assigned. You will now see all results when visiting the main path, and if you visit the path with topic name appended the list will be filtered to show only nodes with that topic. There is a bug that kicks in sometimes when using term name as the Validator, if you have different terms with the same term name: TermName views argument_validator is not working as expected. The patch from that issue is working, as reported by the question author usernameabc, so it can be used until a new version is released that includes it. How do I get raw urls with contextual filters to work with views in Drupal 7, when i'm using panels, and panels everywhere? How can I remove the %20 from a URL evaluted by a contextual filter? How to use URL query parameter on a View Exposed Filter?